Product prices and availability are accurate as of 2019-04-03 15:41:11 EDT and are subject to change. Any price and availability information displayed on http://www.amazon.com/ at the time of purchase will apply to the purchase of this product. Install the unit faceing south and make sure the solar panel can get direct sunlight. Normally it can be fully charged in one day under bright sunlight. 1. This light is solar powered, it would be much better to install it in place with adequate sunlight. 2. Charging time and speed depend on the amount of direct sunlight. 3. 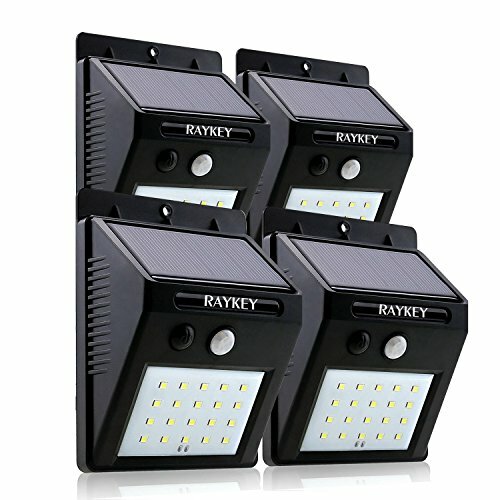 If you plan to use the light in a shaded or indoor area, choose a battery powered motion sensor light. 4. Do not disassemble the unit. 5. For the first time use, charge the solar product by placing it under direct sunlight for more than 8 hours before using. INSTALL EASILY IN SECONDS: Use screws or adhesive pads to secure the solar motion sensor light to any surface(bricks, stucco, siding, wood, metal, glass etc.). No Wiring Needed, Solar energy powered. 3 MODES OPTIONS: Provides 3 different intelligent modes for meeting different needs to save energy. EXTERNAL WATERPROOF SWITCH: Instead of pinhole switch, makes operation easier. Auto on at night / Auto off at sunrise LONG WORKING TIME: With 20 LED lamp and its brightness is 320lm, built-in 2200 mAh rechargeable 18650 lithium battery and lasts 12 hours after 8 hours fully charged. PROTECTION DESIGN: The circuit board is coated with 3-resisting lacquer, which is insulated, damp proof, shockproof, dust-proof, corrosion proof, anti-aging, anti-corona, anti-creeping. The back side of the solar light is completely sealed so it can effectively isolate water and mist.